A call to action! Please? Pretty please? I'm writing to you today for a different kind of reason today. I hope you don't mind. And it's storytelling related. I have a book coming out on June 12. It's my first nonfiction title, and I'm excited and nervous. Excited because I've wanted this book to exist for a long time. Nervous because it's a departure from my fiction. Something new. I don't want to fail miserably. 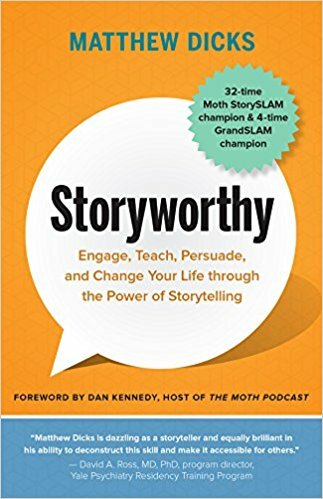 The book is entitled Storyworthy: Engage, Teach, Persuade, and Change Your Life through the Power of Storytelling. It is a book about the art and craft of storytelling. Part instructional guide, part memoir. It's written for everyone, because over the past four years, I've discovered that everyone can utilize storytelling to their advantage. A woman once attended a workshop because she wanted to make friends at work but couldn't seem to get anyone's attention. "I will never stand on a stage and tell a story. I just want to tell a better story at the cafeteria table." Not only did storytelling help her make friends at work, but she went on to perform in our storytelling show and now tells stories as part of her job. I've written this book for everyone. No matter who you are or what you do, storytelling can help you. See? Seemingly intelligent, presumably real people endorse the book. If they like it, you will, too. 1. Preorder the book. Preorders help to determine the size of the first printing and increase my chances of getting noticed right out of the gate. The book is currently available for about $10 via preorder. Please consider purchasing now and having it arrive on your doorstep in June. Buy a bushel, in fact. Give it as a gift. A graduation present. An awkward, unexpected projectile. I've been told that every time you preorder the book, an angel gets its wings. I don't know if that's true, but let's find out. 2. Tell your friends, colleagues, acquaintances, neighbors, and enemies about the book. Ask them to preorder. Share the links on social media. If you know of someone whose company or school or university might be interested in the book, pass on this information. Any and all buzz would be appreciated. Thanks so very much for your support. It means the world to me. Truly. Every writer needs readers and every storyteller needs an audience. You have been remarkable in both regards.